At 8:15 am on August 6, 1945, a single atomic bomb detonated approximately 600 meters above central Hiroshima. That was the moment in human history when this terrifying weapon was first used against a city and its people. The intense heat, thousands of degrees Celsius, emitted by the A-bomb instantly burned human beings to death, soon rendering the city a sea of flames. The tremendous blast smashed houses and the people in them. Many were severely injured. Having managed to escape immediate death, they desperately sought safety, their burnt skin dangling from their flesh. Massive doses of radiation penetrated deep into the bodies of survivors, causing pain and suffering even today. 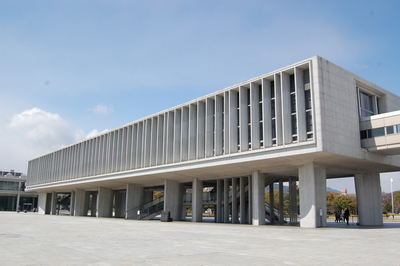 The Hiroshima Peace Memorial Museum, established in 1955 (ten years after the atomic bombing), was one of the peace commemorative facilities designed in accordance with a special law stipulating that Hiroshima be rebuilt as a peace memorial city. Since opening, its overarching mission has been to convey accurately the memories of what happened beneath the mushroom cloud. The museum’s true history, however, traces back to August 7, the day after the bombing. A geologist noticed an abnormal feature on the surface of an exposed stone. He immediately realized that this phenomenon could not have been produced by a conventional bomb. That geologist was Shogo Nagaoka, who would become the first director of the museum. Walking continuously through the burnt plain with his collaborators, he collected A-bombed rubble. These artifacts were later displayed in one room of a community center. His persistent efforts at preservation were eventually taken over by the city’s reconstruction projects, and the museum was built as the central facility of the Peace Memorial Park designed by Kenzo Tange, an up-and-coming architect of the day. In the beginning, the museum displayed the A-bombed roof tiles and stones Nagaoka collected. ­­­­Thanks to decades of generous donations from A-bomb survivors and bereaved family members, the museum currently holds over 20,000 A-bomb artifacts, and even today, we continue to receive personal mementoes. The collection also includes about 70,000 photographs taken by the US military and other survey teams, as well as about 5,000 drawings by survivors depicting their A-bomb experiences. In addition to displaying these items in our permanent and special exhibits, we offer testimony by A-bomb survivors, A-bomb exhibitions in Japan and abroad, peace study programs for youth, and many other opportunities to study the facts of the atomic bombing. Seventy-three years have passed since the atomic bombing, and the museum marked its 63rd anniversary. We needed to work on a wide range of issues that had arisen over time, including preservation and conservation of the artifacts, maintenance of buildings and facilities, and improvement of visitor services. Thus, ­­the museum has been under full renovation for the first time in twenty years. The renovated East Building reopened in April 2017. The exhibits in the Main Building are being carefully redesigned, with the grand opening scheduled for the spring of 2019. The East Building, which won the DSA Design Award Grand Prix 2017, consists of three zones: Introductory Exhibit, Dangers of Nuclear Weapons, and Hiroshima History. On the wall in the Introductory Exhibit, visitors first encounter large photographs showing what Hiroshima looked like and how people lived before the bombing. In the next room, the walls are covered by a 360-degree panoramic photograph of the devastated city taken from the hypocenter after the bombing. On the floor in that room is a newly-installed “White Panorama.” This exhibit presents a miniature model of Hiroshima City out to 2.5km from the hypocenter. 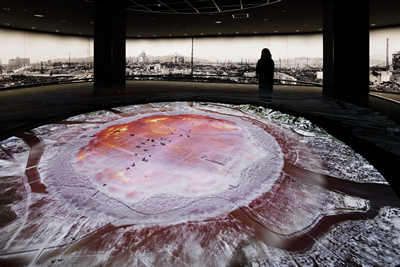 Aerial photographs taken before and after the bombing and a hi-vision video recreation of the A-bomb explosion are projected on the model. The Introductory Exhibit uses the before and after contrast to help visitors comprehend how easily and instantaneously the city and the day-to-day lives of its people were obliterated by an atomic bomb. To supplement written descriptions on the wall, which are necessarily limited by the space available, a large information search device, the “Media Table,” has been added, allowing visitors to investigate topics of interest at greater depth. A summary of panel explanations is provided in sixteen languages as well as Japanese sign language on the touch-panel monitors in each exhibition area. In contrast, the Main Building will present scenes of August 6 as seen by A-bomb survivors. A-bomb artifacts will form the core of exhibits in the Main Building. These silent witnesses to what happened under the mushroom cloud that day wordlessly convey the reality of the atomic bombing. They play a crucial role, especially considering that the day must come when no A-bomb survivors remain. We intend to utilize and display the artifacts in ways that help visitors perceive the profoundly personal pain and sorrow of victims and bereaved family members carried in each and every artifact. We will also feature a section for foreign A-bomb victims, including those from Korea and Taiwan, which were then Japanese colonies, and mainland China. Some of them had been conscripted and forcibly brought to Hiroshima as laborers serving the war effort. Students from China and Southeast Asia, and even US prisoners of war fell victim to the bombing. The number of visitors to the museum in fiscal 2017 reached 1.68 million, nearly 400,000 of which were overseas visitors. The total number of visitors since its opening has surpassed 70.75 million. Visitors are expected to increase further after completion of the full renovation. We hope that ever more people from ever more countries and regions will visit the museum and understand what actually happened in Hiroshima on August 6, 1945. We further hope that they will convey to as many as possible what the city and its people lost to the atomic bombing. The museum will do everything in our power to realize these hopes.